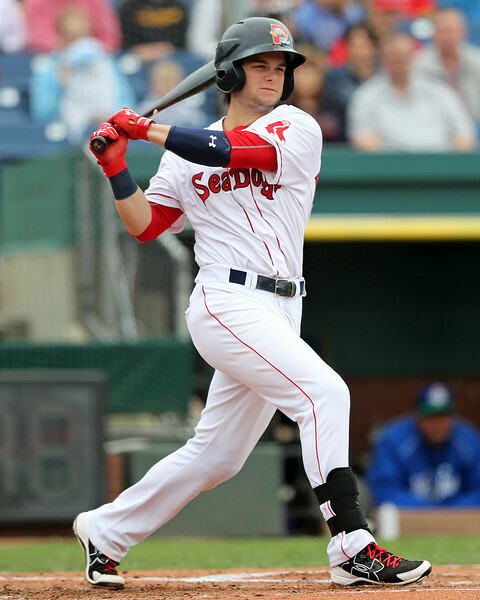 PORTLAND, ME - Andrew Benintendi, the seventh-overall pick in the 2015 draft, opened the year in High A Salem. In 34 games, Benintendi posted a .341/.413/.563 slash line that led to a mid-May promotion to Double-A Portland. I first saw Benintendi last August during his first taste of pro ball in Lowell and wrote up a report on him here. With the promotion to Portland, I was able to get another look at Benintendi during a three-game series at the end of June. The soon-to-be 23-year-old Benintendi started all three games in center field while going 6 for 12 with two doubles, two walks and a strikeout. During this three-game look, my two biggest areas of focus were assessing his ability to use the whole field and his defense in center field. The first time I saw Benintendi he had an aggressive pull approach, and my initial looks defensively last year were limited. Listed at 5-foot-10; 180 pounds, Benintendi has an undersized, yet athletic, strong, and compact build. During batting practice on Friday afternoon, it was clear that he struggled to drive the ball to the opposite field during the first round with weak fly balls and pop ups into foul territory. However, in-game during the series, Benintendi showed the ability on more than one occasion to drive the ball the other way, alleviating some of my concerns on the hit tool with his pull approach, particularly his two strike approach and pitches on the outer half. In Benintendi’s third at-bat of the series, he was down 1-2 and stayed back on a changeup that he drove to left-center for a double. In the next at-bat, he singled up the middle on another off-speed pitch. Again, during the final game of the series; Benintendi faced a 3-2 count and got a changeup on the outer half that he impressively shortened up on and poked to left field, an adjustment you would hope to see from any great big league hitter. Benintendi’s most impressive at-bat of the series may have been his final plate appearance. Facing a sidearm left-handed reliever, which can be an uncomfortable at-bat for any left-handed hitter, Benintendi got a hanging slider on a 2-2 count and did not bail or get caught off-balance. He instead stayed right on it, keeping his front shoulder closed in and driving the pitch back up the middle for a base hit (video here). The combination of Benintendi’s bat speed, barrel control, strike zone judgement, and contact skills have me comfortably projecting him and upgrading him to an above-average future hitter in the .265-.285 range with high OBP’s. Defensively, Benintendi is a solid-average defender in center field. He will not wow you, but he is an alert defender with a quick first step and enough range to both sides. During this three-game series, Benintendi did not always take the most direct routes and found himself getting himself turned around a few times going back on balls to the wall. However, he has the athleticism and body control to make adjustments on poor reads and still make the play. The arm strength is average and playable enough for all three outfield positions. He has the athleticism and profile to play all three outfield positions as well, and I personally think his future home and profile is in left field given his power potential at the plate and average defensive profile and arm strength. On the basepaths, Benintendi and Portland certainly weren’t going to test the arm of Phillies prospect Jorge Alfaro behind the plate as a result of Alfaro’s elite arm. However, Benintendi is a solid-average runner with base-stealing potential and great instincts. He has accelerating speed when underway and can go first to third & score from second with ease. I would not classify Benintendi as a burner, but he is at least an average runner with average run times home-to-first and can steal a base. Overall, it is easy to see why Benintendi is so well regarded and the #2 prospect in the SoxProspects.com rankings. When you break it down, Benintendi is a left-handed hitting outfielder with five average-to-above-average tools and the athleticism to probably play all three outfield positions. If Benintendi continues to rake and continues to make improvements defensively with repetition, as I think he will, he could certainly make a case to be in consideration to win the starting left fielder job in Boston as soon as 2017 and find himself getting an early look in the big leagues as soon as late this summer. As with most young prospects, I would expect an adjustment period for Benintendi upon his initial call up as he faces more advanced pitching. Additionally, a case can be made that he still has some room for improvement on the defensive side, and it would be better for that to take place in the minors than under the bright lights of the major leagues. Consider also that he has played only center field since signing, and that he would primarily be called upon to play in front of the Green Monster in left field at Fenway--a tough transition for a player with a great deal of experience in an outfield corner, never mind one with none in pro ball. However, a late August/September call up still might be the best course to get Benintendi his first taste of the big leagues, begin the acclimation process, and face the kind of potential challenge he has not really faced (for more than a couple weeks or so) since entering pro ball. Photo credit: Andrew Benintendi by Kelly O'Connor.